Up and down, down and up. Anton Lander’s hockey life in North America has turned into recurrent flight between Edmonton and California. In an interview with hockeysverige.se, he talks about his rough season, the constant travel between the NHL and AHL, the decision to let his wife and son stay in Sweden and the future when his NHL contract with the Edmonton Oilers expires. “I know that my career isn’t over just because I don’t stay over here,” says Lander. Note that the original article was written in Swedish and has been translated into English. Anton Lander sweeps the long sweaty locks of hair from his face and stares thoughtfully at the floor while removing the skates from his feet. We’re inside the Edmonton Oilers’ spacious dressing room in the brand new Rogers Place, a place most hockey players can only dream of entering. It’s a hockey haven that exudes luxury and optimism. But for Lander, it has become an existence marked by instability and uncertainty. When hockeysverige.se meets the Swede, it’s just 24 hours since he returned to the NHL team after this season’s third assignment to farm team Bakersfield Condors in California. If there is one player who could be likened to a human yo-yo in the NHL, the 25-year-old fits the bill. It’s not the hockey life he’d like to lead at this point of his career. What he has experienced is the flip side of professional hockey in North American. If you can’t hold on to your spot in the line-up, you can quickly turn into a throwaway player. For Lander, this has had consequences for his family, his wife Malin and son Viggo, who turns one year in April. “Some family stuff happened back home, so my wife and son went back. Then it felt like it was one of those seasons where it’s very much up and down, so we decided it was best if they stayed in Sundsvall,” he explains. 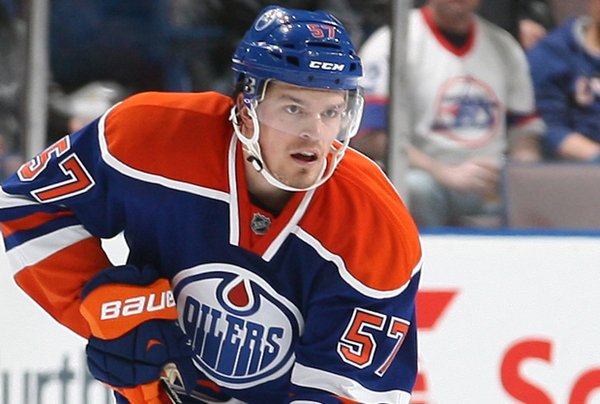 Anton Lander’s mess of a season has been confusing to follow from a distance. In the NHL, where he has a goal and three assists in 22 games, his performance hasn’t been steady enough to secure a spot on Oilers’ roster. In the AHL, however, he has been on a scoring spree. In the 20 games he has played with Bakersfield, he has 16 goals and 32 points. “I felt like I had taken a couple of steps forward compared to last season, which was not good at all. And it felt good in the last few games before I was sent down the first time (in November). Perhaps it wasn’t so bad to be sent down either because I got the chance to play more offensively, get a lot of minutes. I thought I found the touch you need to be a threat out there. It was useful,” he says. Lander is in the final year of his contract. The challenging season, combined with the fact the Oilers are gradually making their roster younger, makes a new contract with the team unlikely. He admits that thoughts of leaving North America are crossing his mind. “Not really. Of course, you miss stuff back home, but not hockey-wise. You still get a fairly large part of the summer at home in Sweden where you can meet friends and family. But I miss seeing my brother play (Filip Lander, defenseman with Sundsvall Hockey). Stuff like that. But it’s my sixth year over here, so those feelings have diminished, even though home will always be home. Do you see a future in the SHL? The uncertainty about his position on the team makes it hard for Anton Lander to fully enjoy the success the Oilers are having this season. He says he feels like he’s a part of the team, but perhaps not in the manner he would if he were a regular on the roster. “It’s the old cliché that you take it day by day. Because I never know where I’ll sleep at night,” he laughs. That cautious attitude pays off later that same day. Immediately after a 5-1 defeat at the hands of the Chicago Blackhawks, Anton Lander was sent down to the AHL again. For the fourth time this season. You gotta feel for the guy. He does everything right in the AHL and is a star. But he just doesn’t have the foot speed or the finishing touch in the NHL to stick around. I’ve really liked what I’ve seen from him in the glimpses he’s played for the Oilers this season, but unfortunately for him the Oilers have actual depth now. I am still pulling for the guy because I would love to see him become a meaningful player for the Oilers. I feel for him because I can think of other players who have footspeed issues who are given enough rope to hang themselves and they seem to get endless opportunities where as Lander is not getting these opportunities. I am not sure why. I would have him in the lineup over Hendricks every day of the week. And I respect Hendricks for his grit and tenacity but he is past due and good teams know the time to move on from these players and give cheap guys like Lander a real chance. He only got offensive time in one season under Nelson and he thrived. Aside from that he has never been given a real opportunity to show what he offers. I gave you a thumbs up cuz I agree with most of what you say but I think you prove the reason Lander is not a regular in the lineup. Hendrix may have foot speed issues but he has still managed to score, rarely but still at a greater rate than Anton. Yeah – its a tough one. Hard to ignore those points per game in the AHL. Maybe you give him a go at 3c, if we can’t land a guy like Boyle. Pouliot – Lander – Eberle? Still say they have to try Nuge on McD’s right side. He needs the boost and is not sound enough defensively in his own end, in playoff conditions. Young Cagguila is not ready for 3c in a playoff push. Slep – is really not that effective either. He looks better than what he is really accomplishing. I always hear that Landers biggest hurdle is between his ears. At some point this season, maybe he says Eff It, and just goes for broke. If he does, he may find that’s the way he needs to play to get another contract. He clearly has a scoring touch and an offensive mindset, based on his AHL numbers. I hope he finds some of it in the NHL this season, or in the playoffs. I’ve always thought lander was a solid guy, i hope he finds a way to keep his NHL career going. First time I have ever heard he has a problem between the ears. If he had an extra gear he would be in the NHL, it’s as simple as that. I figured he was good enough as a forth liner. Perhaps if they just left him there and gave him a chance to play on a stable line for a while he would gel and become an asset. Sending him up and down all the time can’t be good. However ultimately it is up to him and a few coaches now have done the same thing…they must have their reasons. Can’t be easy. This guy seems within an inch of being an everyday NHL’er if he can add just a little bit of anything to his game, one would have to think with his faceoff and defensive play abilities, he’d be a full timer. Easy to say from behind a keyboard, but if he could say screw it, and just go grind and agitate and head for the net every shift, that would be enough to secure him the big paycheques above a fading grinder like Hendricks. If he’s not going to be a scorer which it appears that way, seems like he’d just have to add a bit of recklessness to his game to be a very good fourth liner similar to Pitlick. Then you never know, secure himself a bottom six role and maybe the scoring touch makes it way to the NHL after a season or two. Hopefully things work out for Lander, he seems so close to be a league envied bottom six guy like Pitlick, if he can just take another step in any direction I think he’ll be there. I agree – the difference between staying up vs being a tweener, may be in attitude. He seems careful, thoughtful, cerebral, respectful. He may have to save a lot of that stuff for his off ice activities. Lots of nice guys off the ice, aren’t that nice on it. no chance that Vegas would take him is there? Why? He is on waivers once a month. so Lander is “really pissed off” about going up and down from the NHL to the AHL? then he knows what he has to do to stay in the NHL and he hasn’t been doing it. he has to score and he can’t. not the Oilers fault pal! No controversial mistranslations about teammates’ work habits or attitude? Nothing from his agent saying ‘Edmonton better use him right or I’m bringing him home SNART’? Good stuff. Keep pluggin away Anton. It will either come or it won’t but no one can say you didn’t give it your all. Little known fact: Anton leads the league in air mile points. I ran into Anton, pushing his stroller on the street a few months ago as I was walking to University haha. I got a chance to talk to him for a good ten minutes, and you know when you can see frustration in a person’s eyes? That’s exactly what it looked like when we chatted about hockey. He said the pace of the game change between the leagues is almost impossible to describe. But I gotta give it to the guy, every time he gets sent down, he finds a way to get people’s attention again. The opening quote about him knowing his career isn’t over if he isn’t in over here. Tells me this is a player who is planning to go back to Europe next year. Lander is just as good as most on this team, in a forward position, not named Conner, Leon, Letestu, Maroon.